Early results from Georgia's election show a resounding win for candidates backing President Mikhail Saakashvili. Mr Saakashvili's National Movement-Democratic Front received 78.6% of the vote and took all the seats in parliament, according to exit polls. The result has given rise to fears that Georgia could become a one-party state. The poll was overshadowed by a fierce dispute between the president and the leader of the semi-autonomous Ajaria region, Aslan Abashidze. There were fears that Mr Abashidze, who refuses to accept rule from Tbilisi, would try to rig the vote in favour of his own party. It is the third nationwide election in almost as many months, but across the country Georgians queued outside polling stations to cast their votes. Mr Saakashvili was catapulted to power after leading what has become known as the "rose revolution" against the former leader, Eduard Shevardnadze, last November. 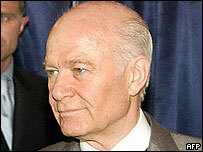 Since then, he has promised to clamp down on the corruption that was so prevalent during the Shevardnadze era. None of the other 16 parties running in the election managed to pass the 7% barrier needed to win seats. Critics warn that without an effective opposition Georgia is in danger of becoming an undemocratic one-party state. Mr Saakashvili himself appeared to acknowledge the problem after polls closed on Sunday. "I am not pleased that there is not more opposition representation because that would have helped my party too to consolidate," he said. "But that is the reality, the post-revolutionary reality." Mr Saakashvili said his party had swept the board in Ajaria, and praised Ajarians who "did not buckle under enormous pressure". He had sent his prime minister to oversee the vote there. His comments suggest Mr Abashidze's days as head of the restive region are numbered, said the BBC's Chloe Arnold in Tbilisi. Last week the country was brought to the brink of armed conflict after Mr Abashidze barred Mr Saakashvili from entering Ajaria. Mr Saakashvili imposed economic sanctions on the renegade Black Sea territory and put his military on high alert. The international community, led by Russia and the United States, stepped in to help broker a truce. But many believe the fragile reconciliation is unlikely to last. "I think there could be more tension in Ajaria," said Akaky Asatiani, leader of the opposition Union of Georgian Traditionalists. "There will almost certainly be because, although I don't like to criticise personalities, Mr Abashidze and Mr Saakashvili are completely incompatible." 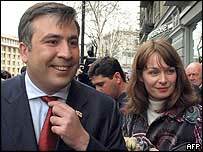 Mr Saakashvili, a US-educated lawyer, is keen for Georgia to join western institutions, including the European Union and Nato. Mr Abashidze on the other hand looks to Moscow for support. In the past Mr Abashidze has been accused of falsifying the vote in favour of his own party. The former regime in Georgia was too weak to bring Mr Abashidze into line; but the new government made it clear it would not tolerate ballot-rigging. Western governments, which are backing the construction of a multi-billion-dollar oil pipeline in the region, will be keeping a close eye on events in Georgia. "The young and charismatic lawyer is almost universally admired in Georgia"